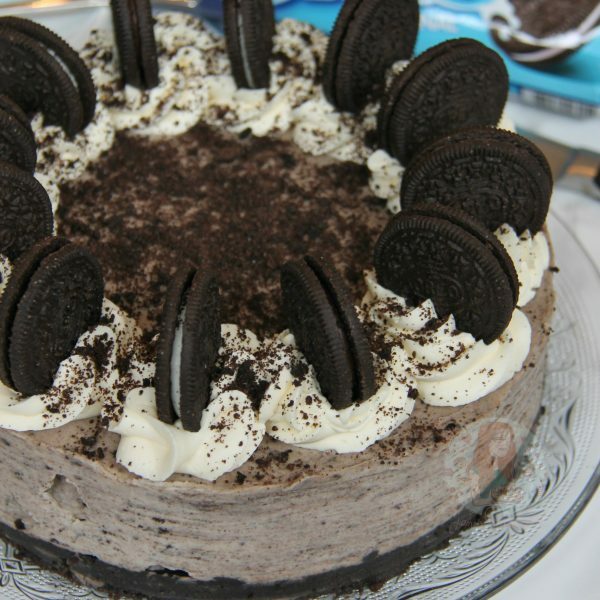 Oreo Base, Oreo Cheesecake Filling, Oreo Decoration.. Oreo Heaven! I have had an insane amount of requests for this recipe – even though there are so many already!! – so I hope it doesn’t disappoint! Oreo’s, as you might have noticed, are a big thing for me as they’re yummy and very popular all over the world. I know that some people aren’t a fan of them, but they do so many different flavours now you probably will find some that you like! Mixing the Oreo flavouring with the Cream Cheese & the rest of it makes it such a DELICIOUS treat! I prefer No-Bake Cheesecakes so much more than Baked ones as to me they are creamier and easier to make, and to me they are a more guaranteed success in comparison to other desserts because I have made so many over my time on this blog now! The whipping of the ingredients in my method is second nature to me – once you have whipped a cheesecake to the perfect texture, it is the same every time! The rules are – don’t whip too fast, and don’t be too scared – then you’ll be fine and you will want to make them again and again! Recipe Updated September 2017 – I use Classic and Brownie Batter Oreos in mine, but you can use any flavour you like! Blitz the Oreos in a food processor until they’re a fine crumb. I don’t remove the creme filling as I like it to bind the biscuits together! Using an electric stand mixer cream together the Cream Cheese, Icing Sugar, and Vanilla until smooth. Add the Double Cream and whisk the two mixes together. 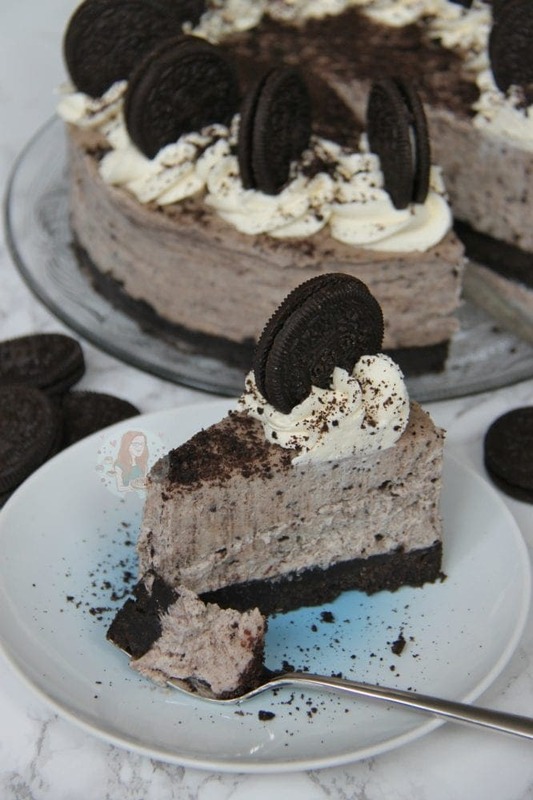 When whisked – fold through the finely crushed Oreos and spread on top of the biscuit base! 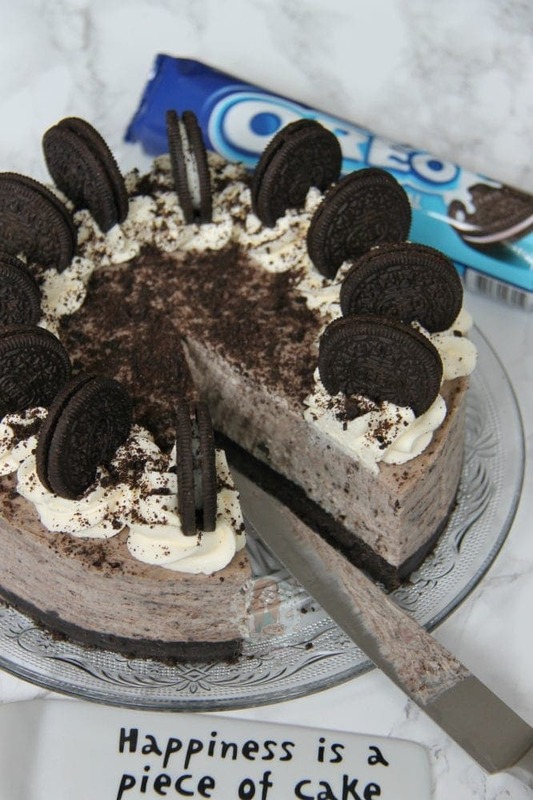 Make sure to keep 12 of the Oreos whole for the decoration, and a spoonful or two of the crumbs. Set the Cheesecake in the fridge for 5-6 hours, or preferably over night! Once set, remove the cheesecake from the tin. Whip together the double cream and icing sugar and pipe onto the cheesecake using a disposable piping bag, and a 2D Closed Star Piping Tip. 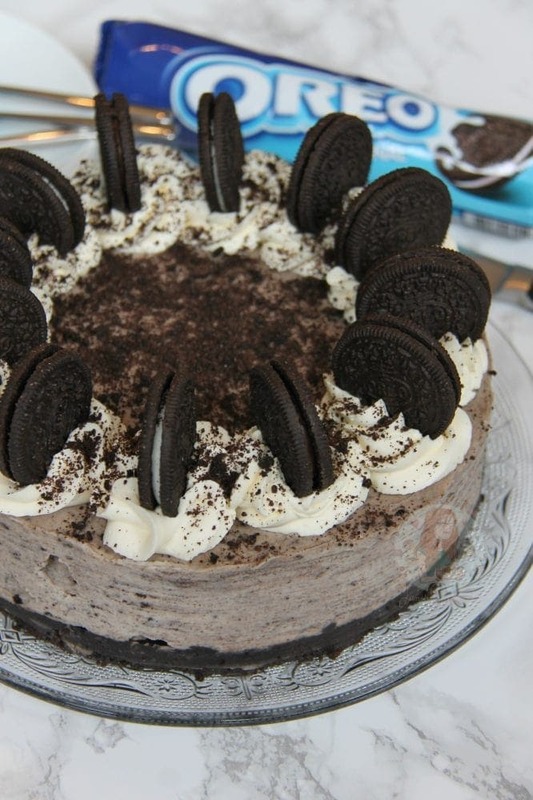 Then, decorate with the whole Oreos, and some oreo crumbs! Enjoy! Like I said in the Method, I use one mixer to make my cheesecake filling – but I use a stand mixer. If using an electric hand-held whisk then try not to use too high a setting as this might cause it to over whip and go all icky! So take your time, it will be smooth and hold itself when the mix is ready! 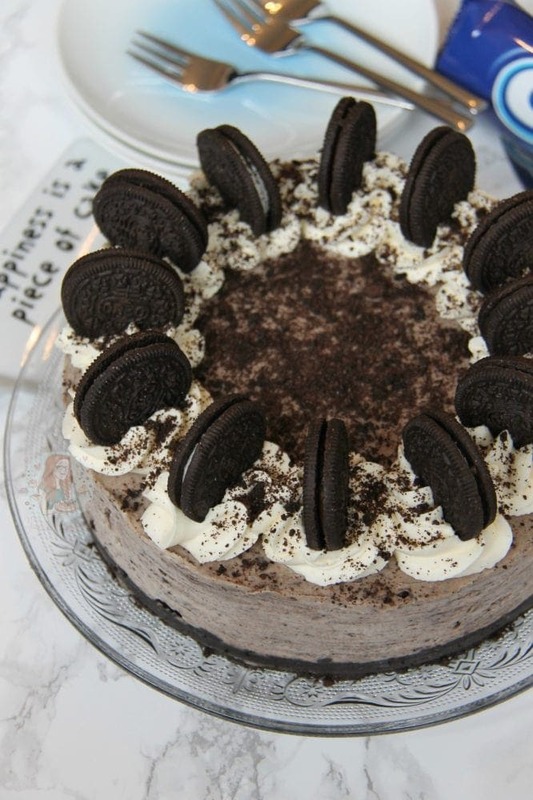 Find my other Oreo Recipes on my Recipes Page! Older Next post: Eton Mess with Homemade Meringues! Newer Previous post: Homemade Lemon Curd! I’m so glad you liked it! Yes, I tend to mush it into the sides as I put it in the pan to try and prevent these, but often I forget haha! 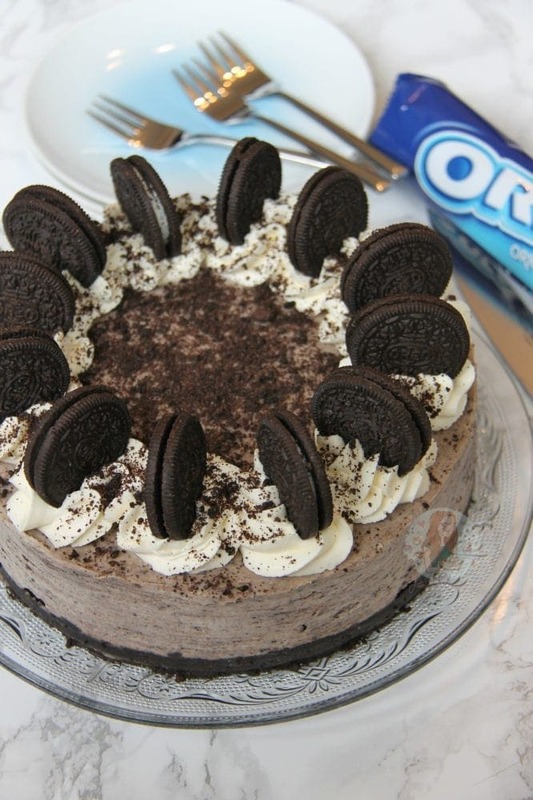 Hey, I’d like to make this for my husband (he loves Oreos!) but I don’t have a food processor – can I bash the biscuits up with a rolling pin or do you think this might be more difficult than with Digestives in a normal cheesecake? Thanks! I’m sure you can, it might just take a while!! Hi Jane, I have made a few of your cheesecake recipes all with success. The ones I have made have all had melted chocolate in them which I think helps to set them. I would like to make the oreo one but as it doesn’t have melted chocolate in it I am worried it won’t set. Will it still set or can I add chocolate anyway. It’ll be fine without, they don’t always need chocolate. If you add in any to this one, it’ll cover the Oreo taste. Just wondering I am wanting to make this but in a 10″ size. Would you recommend using mascarpone or philadelphia cheese for this recipe? Can you do two thirds mascarpone and a third philadelphia so it’s not TOO sweet? Or would you recommend sticking with one? Thanks! Do you have to let the cream cheese soften first? I don’t, just straight in! Hi just wondering is d base really heavy? I don’t find it heavy, but I do like my biscuit bases quite thick. Hi, I am wanting to make this with my cooking club at school. Is there anyway it needs to be adapted to make 10 individual cheesecakes or would you use same recipe? Hi Jane, Sorry if it’s inappropriate to ask here, but I’m just curious – how much would you charge for a cake like this? Thanks! I accidently only used one packet of OREOs for the base and have only just realised once I put it in the fridge. Will it still be okay? How did it turn out? I imagine it might have been a little soggy but im not sure? My filling does not have peaks like meringue its more like a think cake mix or pancake batter smooth texture will it still set? Eh just wondering if when ur putting the double cream in do u have to whip it first?? I don’t personally, but you can if you wish. In all of my cheesecakes I add it in liquid. Hi, I’ve just made this cheese cake but only after I put it in the fridge I realised I hadn’t used my other pot of soft cheese so it’s missing 150g! Will it still set? And I also didn’t add the Oreo crumbs to the filling but that was choice I just didn’t want them in. I believe it should still set fine – it might be slightly softer however. I have made many of your cheesecakes before all which are very tasty, just woundering why this Oreo one has a much higher quantity of cream cheese than all the others ? Because otherwise it’s very thin. The others have melted chocolate or chunks of something inside which bulks it up. Any without any of that I use more cream cheese. Hi ive made the cheesecake twice it taste perfect only thing is Everytime i try to slice it i cant seem to cut the base together as its far too hard any suggestions why? I’m not sure really – try decreasing your butter to only 100g next time and see how it goes. Ok will do! 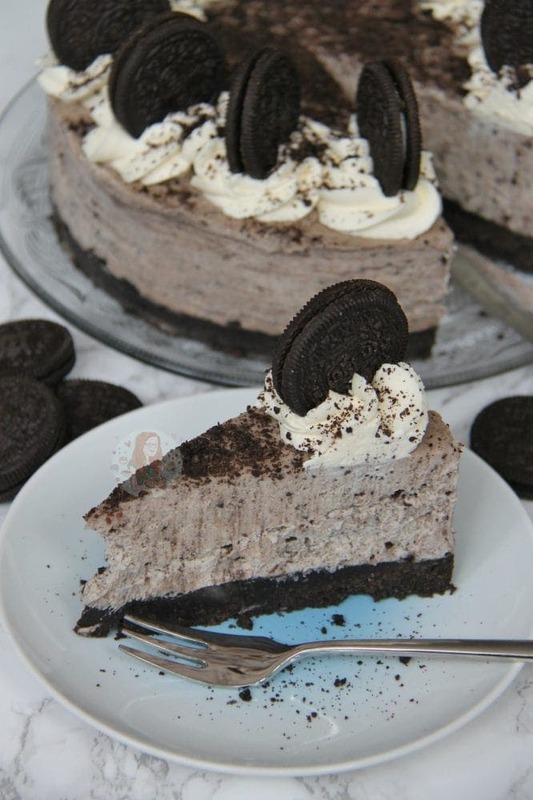 Also how do you move the cheesecake to a plate or any other flat dish sorry im complete amateur i dont really bake but your recipes are so good and make it sound so easy! I lift it off the base with a thin metal spatula, and move it. How long does this take to set, and is it best in the fridge or freezer? Also, when you say “2x 154g Pack Oreos, Crushed (Keep 12 Oreos for decoration)”, does this mean 2 packs for the filling and another 12 for the decoration? 100% set in the fridge for at least 5-6 hours, but preferably over night. And No, it means two packets in total with 12 of them taken out for the decoration on top. what is a double cream ? Thick, high fat, liquid cream. I am not a fan of cheese cake or cheese in general but I made this for my husband & daughter. I had a cheeky lick of the spoon while mixing to test it & because it was good I tried a slice once set. Oh wow! It was divine ? This could be a potentially dangerous discovery. Thank you for supplying the recipe, it’s so quick & easy & now we have a delicious dessert for the next couple of days. Hi this looks amazing ! Around how long does this cheesecake take to make ? Making 10 minutes, Setting -12 hours. Hi could I substitute double cream for whipped cream, when making this ? ? Do you mean whipping cream or already whipped cream? If you’re from the UK I would still recommend double cream because the fat content is the highest, if from America then heavy cream. Already whipped cream will not work! I see you did not use any gelatine in your recipe. The cheesecake can actually set without it? ? I find that no bake cheesecake dont travel well in slices. One time i gave some away to friends at work, the slices reached her home flatten. Not sure cos if it’s the summer? have you had any experience before? If you make it correctly, you don’t need gelatine – therefore vegetarians can still eat it! And why would it need to travel in slices? keeping it whole prevents your problem! Nothing against vegetarians, i was just curious because i have seen most recipes call for them. Unm…Because i tend to share with a few friends who dont know each other so cutting them into slices would be a more feasible way, no? Sorry maybe my questions sounded silly or something . I have never seen this type of cheesecake looks terrific! Hey, do u use salted or unsalted butter? Thank you for replying. I was think about making red velvet cupcakes. Thank you again! Awesome 🙂 I can’t wait to hear the results. Have a great day! I can’t wait to try this recipe! Yum! Hehe thank you! Its definitely a favourite of mine too! Making this on weekend is a must! Thanks for the recipe! OMG that looks ridiculously good!!! This looks like a no-brainer for something the kids would love to eat and help to make! ?